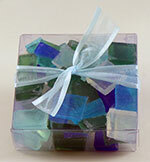 Sea Glass Soaps - 6 ounce box. Soap that looks like Sea Glass! Dreams of beachcombing and found treasures. Glycerin and fresh fragrance. Soaps are made with glycerin, fragrance or essential oils. We add botanicals or infusions to achieve the perfect soap! Many people ask "What is glycerin?" The answer is that glycerin is a humectant, which means it absorbs moisture from the air. That is why our soap keeps working for you as it absorbs moisture back into your skin to keep it from drying. Many times commercial soap makers remove the glycerin from the soap and sell it to lotion makers, so what you really are buying is detergent and that is why your skin will feel dry after using commercial products.